HATTIESBURG, Mississippi (CNN) -- Thousands gathered Saturday for the funeral of former NFL quarterback Steve McNair, who was killed a week ago. 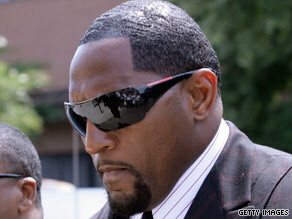 Baltimore Ravens linebacker Ray Lewis arrives for Saturday's funeral service. "Steve was like a hero to me and heroes are not supposed to die," Tennessee Titans quarterback Vince Young told the crowd, his voice cracking. "He inspired me," Young said of his longtime mentor. "He has helped me on every decision I have made." McNair's casket -- sitting front and center at the University of Southern Mississippi's Reed Green Coliseum -- was draped with flowers. Adjacent to it was a large photograph of the slain quarterback, one of many. A floral wreath framed a No. 9 jersey. Among those in the audience were former NFL quarterback Brett Favre, Baltimore Ravens linebacker Ray Lewis and Chicago Bears quarterback Jay Cutler. Mississippi's Oak Grove High School football team, for which Steve McNair Jr. plays, was also there, dressed in their game jerseys. "We are here to celebrate a king," Lewis told the crowd. Titans coach Craig Johnson and McNair's coach at Alcorn State University, Cardell Jones, also spoke. Police in Nashville, Tennessee, said McNair, a 36-year-old married father of four children, was killed by his mistress on July 4 in what they have classified as a murder-suicide. Sahel Kazemi, 20, first shot McNair in his right temple, then fired three more shots at close range, most likely while he slept in his condo in downtown Nashville, police said. The young woman then sat on the couch next to his body and killed herself so that she would fall into his lap, police said.